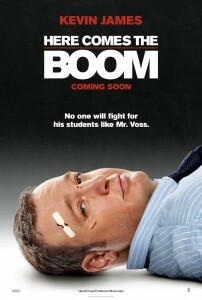 Scott Voss (Kevin James) is a 42-year old biology teacher at a high school that is in financial trouble and facing cutbacks. The first area to get axed is the music department (isn’t it always?) headed by Scott’s best friend The Fonz Marty (Henry Winkler). 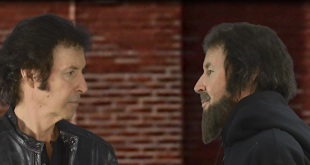 Scott vows to figure out a plan to save the music and Marty’s job. He just needs to find a way to earn $50,000.00 by the end of the school year. While teaching a US Citizenship night class to earn the extra money, Scott meets former MMA fighter Niko (Bas Rutten, an actual former MMA fighter) and learns that mixed marital arts competitors make some pretty big bucks, even if they don’t win. Scott convinces Niko to train him and begins competing in matches hoping to raise the 50 G’s and maybe also woo the hottest school nurse in history, Bella (Salma Hayek) in the process. Well for one, this movie deserves a toast because I star in it. That’s not true. 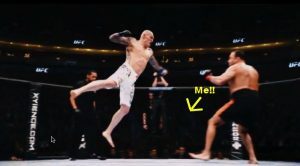 But I was an extra in the big UFC fight scene at the end. Back in spring of 2011, I received a casting note for extras to portray spectators for a new comedy about the UFC starring Kevin James and Salma Hayek. It sounded like an absolutely awful movie but also like a fun way to spend the day and see the Hollywood movie-making process in action. So I convinced my husband to take the trip with me and we headed over the Tsongas Arena in Lowell, Massachusetts. The small venue had been transformed into the MGM Grand Vegas and “UFC” banners were plastered everywhere. I noticed there were already hundreds of people sitting in a section. Upon closer inspection I noticed those people weren’t moving. At all. 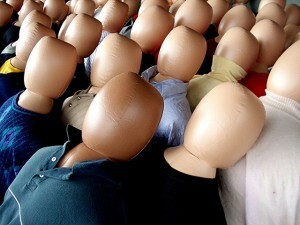 Turns out, they were dummies—faceless mannequins with wigs and real clothing. It was pretty creepy. Here’s a picture of me with one of the dummies. Anyway, it was a very long day and surprise, movie-making is not very exciting at all. It’s a lot of waiting and sitting around. They shot the same scene about 15 times (Henry Winkler giving Kevin James a pep talk). We also had to pretend to cheer and clap and by pretend I mean miming applause and not making a sound. It’s pretty hard to clap without making noise. Try it. Oh you can? Okay smartass, trying sitting down and making a clockwise circle with your right leg. Now raise your right hand and draw a big number 6 in the air. Gotcha! While watching the few scenes being filmed that day, I tried to imagine what the final product would be like and I can’t say I was expecting much. Then I learned it was a Happy Madison Production (Adam Sandler’s company) and that made me even more pessimistic about the outcome. I envisioned one and a half hours of terrible juvenile “humor” featuring some combination of poop, puke, fart, and fat guy falling down jokes with unbearable characters. Then guess what? I saw the movie and most of those things (I said most, let’s not get crazy here) were amazingly absent and I found myself—wait for it—enjoying the hell out of it. Thanks for sitting this one out Sandler. I’m being completely serious. This is a BIG step-up from usual Bucky Larson-type diarrhea Happy Madison’s been spurting out in recent years. It’s like they actually tried this time instead of just relying on go-to gross-out gags and names big enough to turn a decent profit at the box office. A big reason for this, of course, is the writing. James wrote the screenplay along with Allan Loeb (Rock of Ages, Just Go With It) and Rock Reuben (King of Queens) and the underdog story has more than a few well-earned laughs and heart for days. It’s part Rocky, part School of Rock, and no part Zookeeper. 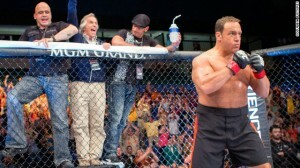 Kevin James reportedly trained for 14 months to get in shape for the role. This along with his character having a collegiate wrestling background makes the seemingly ridiculous premise somewhat plausible and was a very smart move rather than going the doofy fat guy bellyflopping around the ring and getting punched in the nuts over and over route. Yes, there’s a good amount of slapstick and one gag involving bodily fluids during Scott’s first few breaking-in bouts, but by the end of the film, James actually looks like a credible opponent for a televised UFC match. Really. And his character is so damn likable you can’t help but root for him no matter how much you hated Paul Blart: Mall Cop. This is his best performance in years. The rest of the cast is just as agreeable. I found Bas Rutten to be a wonderful revelation; the endearing and comically talented former UFC fighter may just have a bright future as an actor. Henry Winkler is wonderful as always. And while the impossibly gorgeous Salma Hayek being cast as a love interest for Kevin James may seem like an eye-roller on paper, she has an unassuming way about her that makes it believable. The chemistry of the entire cast is spot-on and they all click together very well. It’s clear these people are real-life friends that are having fun working together and it brings a nice charm to the movie. As is the case with most PG-rated inspirational follow your dreams and overcome the obstacles sports movies, Here Comes the Boom is corny. Very corny. 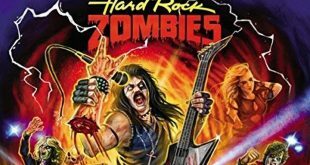 It’s extremely predictable and there are a whole lot of clichés, unnecessary swelling musical cues, and cringeworthy dialogue (“Without music, life would be a mistake.”) It’s to be expected though, and as over-the-top as it is, its heart is in the right place. Like applesauce that sits in a hot car for a few hours, you just need to have a stomach for these things. 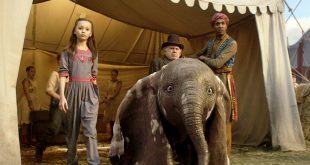 Most of the film is pretty unrealistic and would obviously never happen in real life (Joe Rogan flying an entire class of children to Vegas on his own dime and goodness of his heart? LOLZ…and also, wouldn’t that almost be as much money as it would cost to save the music program?) but again, you just have to let it go and enjoy it for what it is. The movie could have done without many of the numerous rushed subplots which were resolved almost as quickly as they were introduced. In particular Scott’s brother’s (Gary Valentine, real-life brother of Kevin James) career troubles and his student Malia’s (Charice—I guess she only goes by one name) issues at home with her father forcing her to quit music and work in the family restaurant. There’s also a last act twist which puts more pressure on Scott to win the big fight that I guess served a purpose, but really wasn’t needed. I was pleasantly surprised by how much I enjoyed this one. 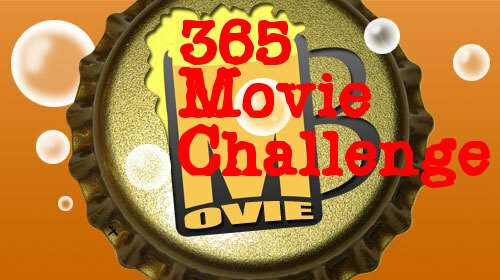 The likeable cast and undeniable heart overcome the clichés and predictability. This is one the whole family can enjoy together, even the parents. Thankfully containing more heart than farts, it’s just plain fun and we all need that every now and then. I’m sure it will become a basic cable staple in a year or so, and I can definitely see myself stopping on it while flipping through the channels (especially during the MGM fight scenes, which I will watch in slow-motion until I spot myself). Take a Drink: every time “Boom” by P.O.D. plays. Take two for the acoustic Winklerized version. Take a Drink: every time Scott gets beat in a match. Take a Drink: every time someone mentions what a wonderful person Marty is. Take a Drink: every time Niko tells Scott he should just focus on losing as quickly as possible rather than work on his offense. Take a Drink: every time Malia talks about how much music means to her. You had a few valid points but you are corny. Very corny. 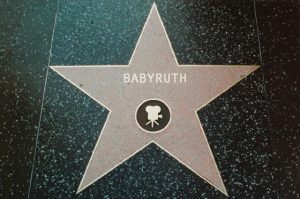 Baby Ruth – what an awesome story! Sounds like a unique way to spend the day – thanks for sharing. 🙂 Great review – I still don’t know if I can forgive Selma Hayek for tricking me into seeing Grown Ups, but I’ll Netflix this so I can see you! Glad to know this wasn’t a bad movie. I actually really like Kevin James and Zookeeper is a hilarious movie so I was kind of looking forward to this one! I was shocked, blown away and flabbergasted that I loved Here Comes the Boom. Nothing I love more than a comedy with heart and good natured characters. The script was actually a lot better than expected and I like how he had a true purpose to fighting because not only did he help the kids but he helped himself and netted Miss Hayek in the process. It’s like what Mighty Ducks and Rocky had a love child and it’s Here Comes the Boom! 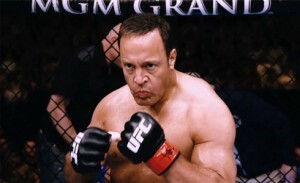 Kevin James should do more like this. (Two Beers) Yep. I said it.